Greek journalist Kostas Vaxevanis (centre) was arrested on April 10, 2017 on libel charges. 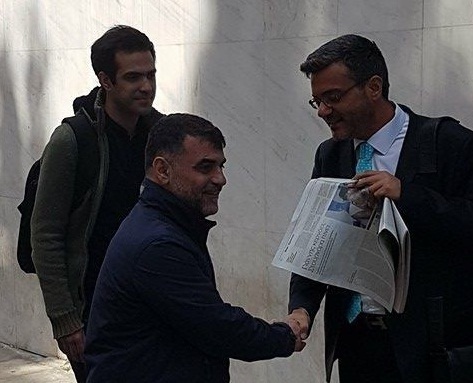 The International Press Institute (IPI) today condemned the arrest of prominent Greek investigative journalist Kostas Vaxevanis on charges of libelling the wife of the head of Greece’s central bank. Vaxevanis was detained yesterday morning after appearing voluntarily at a police station in Athens. A prosecutor later ordered his release pending preliminary investigation. According to Greek media and information provided by Vaxevanis, the charges relate to a report published on April 9 in the newspaper Documento alleging that Stavroula Nikolopoulou-Stournara had taken advantage of her husband’s influence to secure public funding for organising medical conferences without going through a public tender. The report also raised questions about Nikolopoulou-Stournara’s links to the pharmaceutical industry as well as the involvement of her husband, Bank of Greece Governor Yannis Stournaras, in the conferences.